Around this time of year, I’m ready to change up the homeschool routine just a little. I know we have to keep plugging away at our work, but it’s nice to add something fun, like homeschooling with Disney. One of the things we love to do is choose a book and a movie to read, watch, and compare. Literature study with movies still counts as school – and it’s fun! There isn’t a right or wrong way to do a literature study with movies – you only need two things: a favorite movie that’s based on a book and that book. Once you have your book and movie chosen, you’re ready to go. Watch the movie and read the book (in whichever order you choose) and discuss the two. Who is the main character in both stories? How are the stories similar? What would you change if you were the movie director? But why stop there? You can take your ‘book-and-a-movie’ idea and, with a few simple tricks, create a week-long in-depth study. Whenever we have ‘a book & a movie’ week I do a quick search on Wikipedia for both items and jot down a few ideas that sound interesting. (I don’t recommend Wikipedia for in-depth research, but it’s a great tool for a quick overview on a variety of topics.) Disney animated films are a perfect introduction to this method – the movies are entertaining, family-friendly, and often different enough from the original story that you’ll have plenty of ideas for great discussions. Begin by searching for the movie on Wikipedia. Grab a piece of paper and jot down any notes you get as you read the page. Look for historical and geographical references, notable people, or other interesting tidbits of information. After you’ve written down some ideas, do another search, this time for the original story. Note the author, the time period the book was written, and any other information that sounds intriguing. Once you have your list, use it do further research on the topic (or have your children help with this step if they are old enough), looking for activity and book ideas to round out your study. When you’ve completed your research, go over the plans with your children to see what interests them the most. Take your ideas and plan a day, a few days, or even a week around your book and movie study. For example, we studied Disney’s Frozen and the original story, The Snow Queen last year. While doing a bit of research about the movie I discovered that the setting was based on the geography of Norway, including certain buildings in Norway. Norwegian folk art also played an important role in the film. In a few minute’s research, I had ideas for studying Norwegian culture, geography, and art project ideas. I asked my daughter what sounded most interesting to her and, over the course of a week we read the original story, watched the movie, worked on an art project, read books about Norwegian culture, and learned about the architecture of some of the famous buildings in Norway. You can easily take one simple idea and build a week-long unit study with a bit of research. If you’d like to have a free copy of our Snow Queen study, head to Happy Homeschool Nest and get a free copy. We’ve done this routine quite often – choosing some of my daughter’s favorite animated films, finding the original story, and comparing the two. While it may not seem like much, taking the time to discuss the differences and similarities between the two mediums can build critical thinking skills and teach children how to analyze and discuss literature (and movies!). It’s a gentle approach that provides a great foundation for future literature discussion. 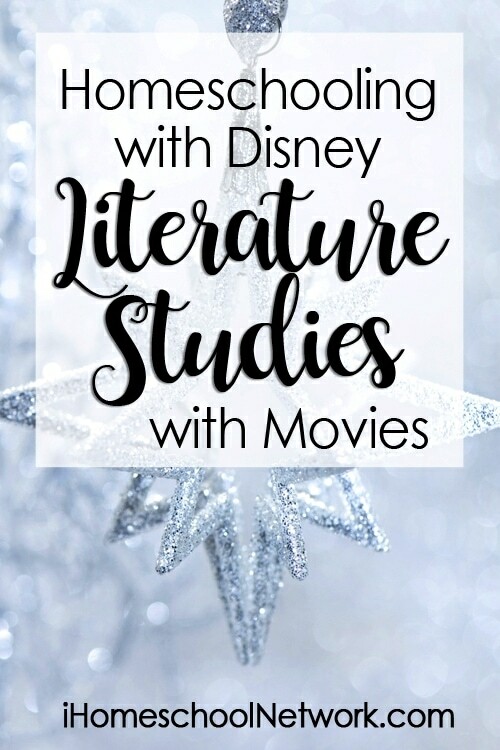 Want a little help getting started on your first literature study with movies? Go to Happy Homeschool Nest and get a free copy of our Snow Queen unit study. Tonia is a busy homeschool mom to one daughter, married to her college sweetheart, and trying to juggle the ever-changing needs of homeschooling and family life. When she isn't busy homeschooling, you'll find her reading in her favorite spot. Such a fun way to study literature! Can’t go wrong with Disney.